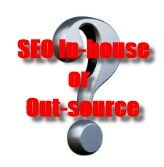 Home » SEO » SEO/SEM: Should You Handle it In-house or Out-source it? The question of whether to handle the SEO/SEM for a business website in-house or pay to out-source it is one that all businesses face at some time. The importance of having a website that is easily found on search engines is something we are all aware of but having the expertise on your staff to handle the various tasks is another matter. The field of SEO has changed dramatically in recent years and now involves many skill previously not considered. These now include social media, on-line advertising, content marketing as well as off-site SEO. These skills can be taught but they take time and for a business whose website is buried deep in the search results, time is money lost. The cost of hiring someone to handle the duties which, depending on the size of your website, where your market is located and a variety of other factors could be more expensive than a small business can afford. Finally there is a combination of the two where a business has a staff member take on portions of the role while paying for an SEO/SEM company to assist them with some task and provide consultation on others. So how do you decide whether to out-source, handle it in-house or try a combination of both? Well, there are advantages and disadvantages of each option so let’s take a look at some of them. Based on a review of these factors, the overall costs can vary widely. Outsourcing for a large business that includes all of the above tasks could run anywhere from $5000 a month to upwards of $10,000. A small business could obtain the same service for less depending on which services they require. Fewer services would naturally bring the cost down however be cautious of companies that promise to get you on page 1 of Google for only $250 a month. They will probably be devoting 2 to 3 hours a month to your business, using blackhat tactics and you won’t see results that will last. Also be wary of companies that quote you a price for standard priced packages. This would be like a mechanic quoting you a set price for service on your car without first checking to see what is wrong. A reputable SEO/SEM company will take the time to conduct an analysis of your situation and provide a complete report of what they found with a quote for services. One of the bigger issues with out-sourcing is loss of control. You may not be aware of what is being done on a daily basis, only get reports monthly or less and sometimes don’t have immediate response to questions or problems. Additionally, many times you are locked into a long term contract and are not satisfied with the results. Although these can be daunting concerns, the key to overcoming them is to ensure that before signing any contract you are careful to ensure it is specific in the tasks you require, that reports provide you the information you want, not what they want to report and that it includes hard goals and objectives. Don’t be satisfied with “improve your overall keyword rankings” or “get you more traffic”. The goals and objectives need to be in line with your business goals, which are to increase revenue. It should also spell out your options if goals and objectives are not met. A big advantage of out-sourcing is that you don’t have to devote your time or personnel. Just make sure that you are actually in control by assigning a single point of contact within your company to handle all coordination. Lastly, when out-sourcing be sure that you have a 24/7 point of contact when things go wrong on weekends and at night. 3. Expertise – Probably the biggest advantage of out-sourcing is access to highly skilled personnel. When negotiating with a company for SEO/SEM services you should request to see the training and experience of the personnel that will be handling your tasks. Look for certified training in the areas you desire such as PPC or analytics. A reputable company should have a person that is Google Adwords or Google Analytics certified. There are a number of other certifications but more important is a review of past clients. Certifications by themselves do not mean good work so look at what their customers have said about them. Check online reviews of their company and ask for references. Once you find a company that has a variety of trained personnel and a history or success you are much more likely to be satisfied with the results. Two disadvantages of dealing with a company such as this is that their pricing is generally higher as they have more overhead to cover and you normally deal with a point of contact that then has to deal with several of their staff members that are handling the individual tasks. This makes it more difficult as you normally do not deal directly with the person handling each task and your point of contact may not be knowledgeable in all the areas. If your relationship with your point of contact is good this disadvantage can be overcome. On the positive side, if you find a reputable company they have the advantage of devoting specialized personnel to oversee the various tasks so you get the benefit of the best people on each area. They generally will have had experience with any problem that may arise and they more often than not are constantly upgrading their skills through training and probable utilize the very latest in tools and software. When considering out-sourcing be sure to determine whether the company you are contracting with will be handling all task themselves or will they be out-sourcing them. If they are out-sourcing some tasks they may be marking up the cost they are paying so consider doing the out-sourcing those tasks yourself to save money. Out-sourcing may not be on option for many small businesses as they may not have the budget and in-house becomes the only option so let’s consider some of the advantages and disadvantages of in-house SEO/SEM. Many small businesses find that handling all SEO/SEM functions in-house is the only way they can go however, without adequate training or background they can actually do more harm than good. Keep in mind that you expect the results to at least return the cost. Training can be obtained either on-site or online but training them should be your first task. Remember that you aren’t looking for a rocket scientist. SEO/SEM can be taught and the cost of such training is insignificant compared to the possible return. Another option is to hire a skilled individual for the position but either way the person must have the requisite knowledge. Keep in mind that if you are looking to hire a skilled person check the going rate is in your area. Don’t overpay, but don’t hire someone that will accept a lot less than the average salary for someone with their skills. Finally remember that there are tools and software that will be required so be sure to factor their costs into your decision. Don’t make the mistake of thinking that because you handle it in-house it doesn’t cost. Factor in salary, vacation and other benefits and the cost of various tools to do the job properly and you find that it can still be expensive. 2. Control – By handling SEO/SEM in-house you may feel totally in control and you would be partly correct. Unfortunately much of SEO/SEM is controlled by Google, Bing and Yahoo and you are really only reacting to what changes in the business. You do however have full control over what you will be doing in response to changes, not waiting for someone else. If you need to make corrections to web pages you simply do so, not wait on someone else to do them. If you have a question about how you are doing at any time you can pull the reports you need, not wait until a monthly report is sent to you. If you want to make changes to your PPC campaign you can do so at any time and not have to deal with another party to get it done. If the person you hired does not work out you can simply fire them and hire a new person. You are in control of who does what, when it is done and what is reported. Of course on the down side is you are also fully responsible for what is done. If goals and objectives are not met you have no recourse such as you may have with out-sourcing. 3. Expertise – Although you may not initially have the full spectrum of skills for handling your SEO/SEM in-house, over time you can develop them. As mentioned earlier, this isn’t rocket science and ongoing training is the key to success as things are constantly evolving in the SEO/SEM business. Almost all of the highly skilled personnel currently working for large SEO/SEM companies acquired their skills over time through ongoing training and experience. Each time there is a change to the way we do business there is someone that is on the cutting edge and willing to share their knowledge. It just takes time and handling this in-house means that time must be devoted to regular study. Given time and study you can easily match the skills available from a large agency. For those new items that pop up occasionally Google search is always available to find the lately news on them and keep abreast. I find that I devote several hours each week to reading the latest news and updates on the SEO/SEM business. Lastly, there are a variety of tools available to make the job easier to handle in-house. Ensure that if you pay for training an explanation of the tools available and how to use them is included in the training package. I believe that a combination of in-house and out-sourcing is the best solution for both large and small businesses. Handle in-house those areas which give you the best advantage while out-sourcing those which give you the advantages of an SEO/SEM company. By having personnel on your staff to handle some tasks while out-sourcing others allows a business to learn slowly and develop the expertise they need for the future. Depending on the platform used for the website itself it may be beneficial to initially out-source the maintenance and over time an in-house individual can learn to work with most. In closing before deciding to go this route make a careful evaluation of your in-house expertise, what your actual costs will be and the time that can be devoted to the tasks you choose to retain. Consider how much control you feel you need to have over each function and the total cost of each task in-house vs. out-sourcing. It is important that whichever way you choose to go, a single individual be assigned responsibility for coordinating all SEO/SEM functions with your out-source company and all in-house personnel dealing with the individual tasks. This role should not be assigned as some additional duty to someone that already has a full time position as this is a guaranteed plan for failure. The person assigned this role should have their primary focus SEO/SEM functions all the time to achieve the greatest results. Should you decide to contract for out-sourcing be careful in selecting a company to contract and read “What Should Your SEO/SEM Company Be Doing For You?” . The approach you decide to take is ultimately your decision so do your homework carefully before making your decision.